The League of Extraordinary Writers: Illuminae Publishes! One of our own, ex-Leaguer Amie Kaufman along with Stormdancer author Jay Kristoff have a new SSF book out now and it's already on the New York Times list! It's pretty special with a mix of graphics, messages, lots of surprises, but I'll let you read about it by clicking on the cover. The cover is different from any cover I've ever seen. It's made out of something super hi-tech and very shiny. You have to see it to fully appreciate it. I can't wait to read this book! You may be thinking, "This sounds like every sci-fi movie I've ever seen rolled together. Why should I read it in book form?" I promise, the story is really, really exciting the way it's told. Also, there are some twists and turns along the way. I went from "What IS this book?" to "Yep, get me the sequel, NOW!" once I had finished. Sequel will be an auto-buy, and can't come fast enough. The book was really fast paced, and there was a ton of action! The end of the book was so intense and I just loved how everything played out. 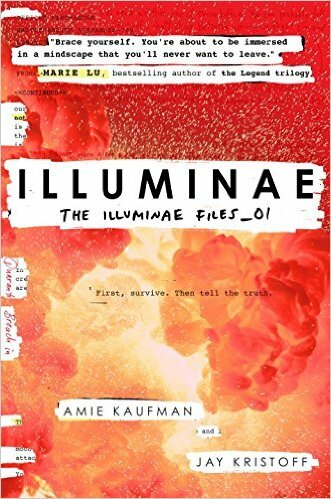 Illuminae did leave on a cliffhanger, so if you plan to read it, make sure you have Gemina ready to go! I highly recommend this one, even if sci-fi isn’t usually your thing, give it a chance and I think you’ll be pleasantly surprised! Nice information. I like your opinion and picture. Greetings from Indonesia. Do you know that in my country, milk comsumption is lower than another country in ASEAN. How could? - SKM is not Milk!